A Life Reading is an opportunity to explore and to see your life as it is right now with honesty and understanding – it provides a mirror of compassionate clarity to see what is. A Life Reading is an individual session, and a deeply personal experience. 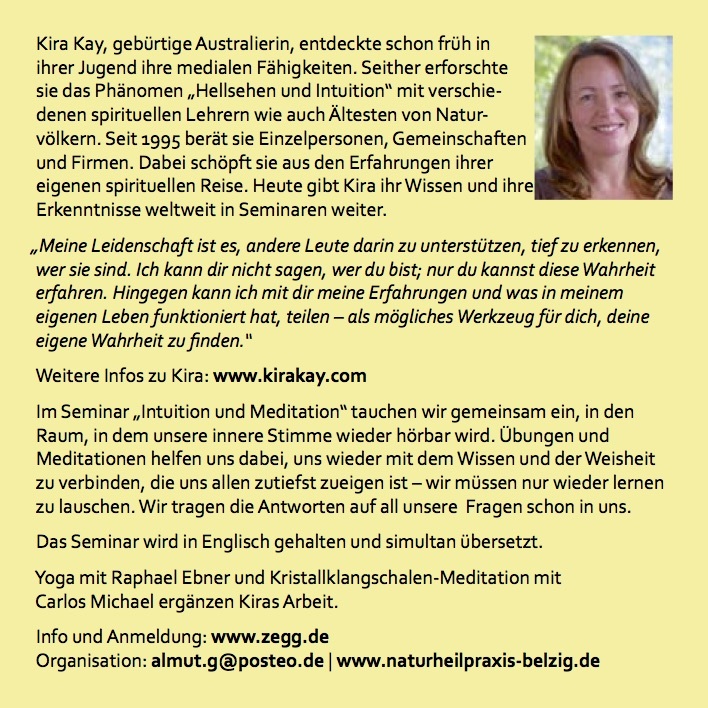 Readings are available by phone, Skype or live in Berlin, Germany. It is approximately one hour in duration, either in person (face-to-face mostly in Berlin, Germany, where Kira resides) or via telephone or Skype. Your Life Reading is recorded, and available for you to download as an MP3 recording. Readings are in English, German translation is possible in some circumstances for face-to-face readings for additional translation fee. How often have you felt or wished you could 'see' more deeply into this situation, this person or this possible course of action? These types of questions face us every day and we do have the answers within us – we simply need to have the courage and practice to hear and see our own answers. Being gently guided and reminded into this deeply natural inner wisdom helps us to directly realise how easy it can be to find our answers. Meditation and Intuition go hand-in-hand and are a compliment to one another. This seminar will include a variety of practical exercises, meditation, discussions and exercises to integrate into your life different aspects of uncovering and using your 'extra' senses. This helps to accelerate the process of communicating and sharing your inner discoveries in an environment that is encouraging of this exploring. This communication integrates these experiences into how we live our lives - making these realisations more readily accessible to ourselves when we need them. Joining the seminar is a wonderful way to meet new friends who have a similar intention of expanding their natural gifts. And being together is supportive, nurturing and fun. Also available and included within the seminar will be Yin Yoga (a gentle and meditative yoga) with Rafael Ebner and 'Sound Diving' (meditative sounds, including crystal bowls & wave harps) with Carlos Habig. Wir tauchen gemeinsam in einen Raum ein, in dem unsere innere Stimme hörbar wird. Übungen und Meditationen helfen uns dabei, uns mit dem Wissen und der Weisheit zu verbinden, die uns allen zutiefst zueigen ist – wir müssen nur lernen zu lauschen. Wir tragen die Antworten auf all unsere Fragen bereits in uns. Zum Programm gehören Yoga mit Raphael Ebner und Klangschalen-Meditation mit Carlos Michael. The Australian desert is an extraordinary ancient land with open skies and vast wide planes. 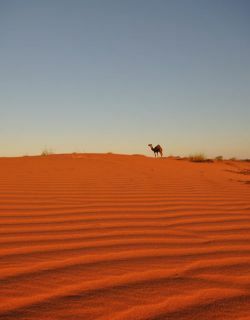 This is a walking meditation retreat, with camels, in the Australian outback desert. Max and Andrew, renowned ecologists with a long history of offering outback camel expeditions accompany Kira. They will offer knowledge and education on the natural environment that we walk through. 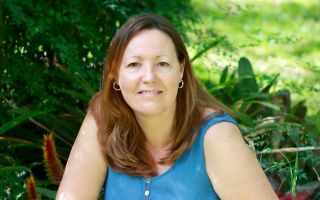 Guidance with dreaming under the Milky Way starscape, along with evening story telling and meditation insights with Kira, will inspire your inner wisdom to awake. Daily yoga and sharing circles give natural space for your insights to emerge and integrate. As we reconnect with our own and each other's fragile and vulnerable humanness - which is implicit when we walk in the vast Australian outback - we have the opportunity to discover resilience, strength and wisdom that were previously hidden. Often our busy day-to-day lives, and conditioning of how we "should" be, obscure our real truths. Walking and living in the desert invites a deep recognition of how fragility and strength walk side by side. As we strip back to uncover these truths, we can recognise how much more potential each of us has. This can open a doorway to understanding how deeply interconnected we truly are. And as we evolve into our empathy and compassion for self and others, our ability to envision our own path ahead becomes simpler, easier and more natural. We humans are so good at making our lives complicated and drama filled, but what happens when the complications and drama dissolve like dew under the desert morning sun? We are left with clarity, vision, and the potential to move forward in our lives. 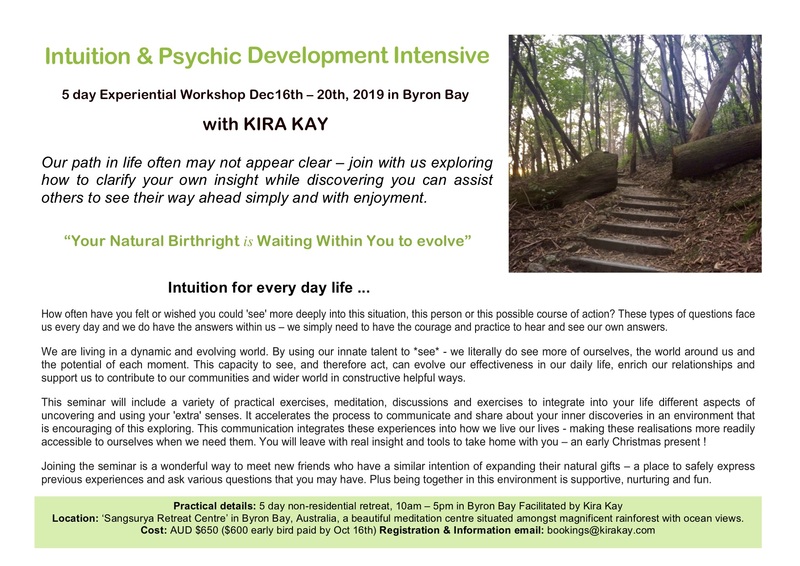 Kira Kay will be guiding daily meditation activities, and facilitating dream sharing and open space to discover more of you. The meditation tools can offer you simple integrative practices that can go home with you as you continue to walk your own path in life. 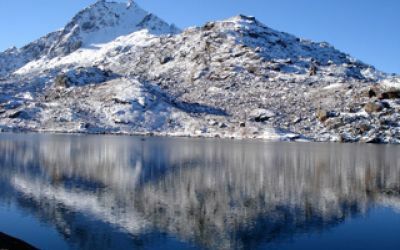 Some of these practices will include uniting breath and body awareness in walking; listening to nature talking; understanding shadows and light; opening into dreaming under the vastness of the Milky Way; calling forth and naming your inner dreams and vision, as well as answering your own evolving vision questions from your own soul. What is Satori? The word Satori originated in Japan and describes that moment of illumination that can only be described as direct experience of profound truth that accompanied certain Zen practices. Once a person experiences Satori it can often mean that their life fundamentally changes. The experience of Satori can vary from person to person but the essence of the state is similar – a profound feeling of peace, a knowing, without doubt – truth. For some people the experience may only be a momentary glimpse, for others it may be an extended period – a common aspect, however, is that the knowledge of the experience is lasting and life changing. Often there is the experience of empowerment, a foundation within themselves creating a more relaxed outlook on life, choices and future potential. 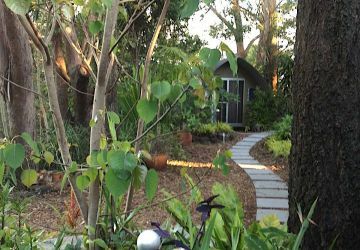 What exactly is the structure of Satori retreat and what benefit can I gain? 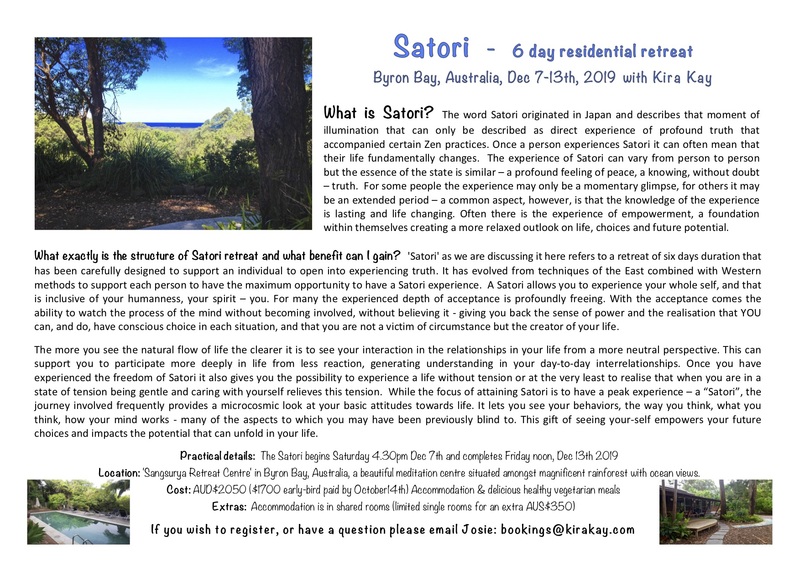 'Satori' as we are discussing it here refers to a retreat of six days duration that has been carefully designed to support an individual to open into experiencing truth. 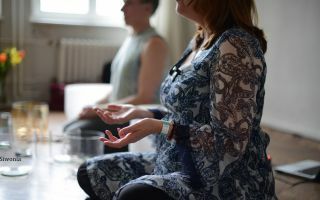 It has evolved from techniques of the East combined with Western methods to support each person to have the maximum opportunity to have a Satori experience. A Satori allows you to experience your whole self, and that is inclusive of your humanness, your spirit – you. For many the experienced depth of acceptance is profoundly freeing. With the acceptance comes the ability to watch the process of the mind without becoming involved, without believing it - giving you back the sense of power and the realisation that YOU can, and do, have conscious choice in each situation, and that you are not a victim of circumstance but the creator of your life. The more you see the natural flow of life the clearer it is to see your interaction in the relationships in your life from a more neutral perspective. This can support you to participate more deeply in life from less reaction, generating understanding in your day-to-day interrelationships. Once you have experienced the freedom of Satori it also gives you the possibility to experience a life without tension or at the very least to realise that when you are in a state of tension being gentle and caring with yourself relieves this tension. While the focus of attaining Satori is to have a peak experience – a “Satori”, the journey involved frequently provides a microcosmic look at your basic attitudes towards life. It lets you see your behaviors, the way you think, what you think, how your mind works - many of the aspects to which you may have been previously blind to. This gift of seeing your-self empowers your future choices and impacts the potential that can unfold in your life. 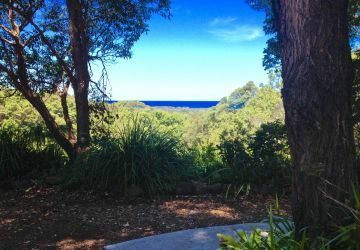 Location: 'Sangsurya Retreat Centre' in Byron Bay, Australia, a beautiful meditation centre situated amongst magnificent rainforest with ocean views. Cost: AUD$2050 ($1700 early-bird paid by October14th) Accommodation & delicious healthy vegetarian meals included. Satori is your uncovering of you, a direct and real illumination that cannot be described, only experienced. How often have you felt or wished you could 'see' more deeply into this situation, this person or this possible course of action? These types of questions face us every day and we do have the answers within us – we simply need to have the courage and practice to hear and see our own answers. We are living in a dynamic and evolving world. By using our innate talent to *see* - we literally do see more of ourselves, the world around us and the potential of each moment. This capacity to see, and therefore act, can evolve our effectiveness in our daily life, enrich our relationships and support us to contribute to our communities and wider world in constructive helpful ways. This seminar will include a variety of practical exercises, meditation, discussions and exercises to integrate into your life different aspects of uncovering and using your 'extra' senses. It accelerates the process to communicate and share about your inner discoveries in an environment that is encouraging of this exploring. This communication integrates these experiences into how we live our lives - making these realisations more readily accessible to ourselves when we need them. You will leave with real insight and tools to take home with you – an early Christmas present ! Joining the seminar is a wonderful way to meet new friends who have a similar intention of expanding their natural gifts – a place to safely express previous experiences and ask various questions that you may have. Plus being together in this environment is supportive, nurturing and fun. 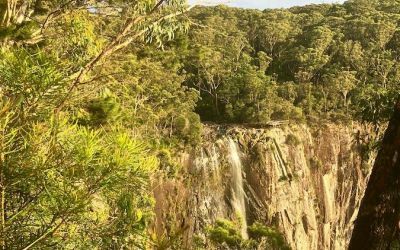 Location: ‘Sangsurya Retreat Centre’ in Byron Bay, Australia, a beautiful meditation centre situated amongst magnificent rainforest with ocean views. 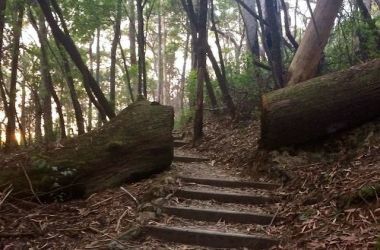 Our path in life often may not appear clear – join with us exploring how to clarify your own insight while discovering you can assist others to see their way ahead simply and with enjoyment.